This is my big news of the week. 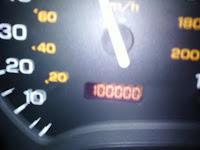 The car that I've had for 8 years has finally driven over 100,000 miles! I really hope that it continues to be as reliable as it has been. The car is only a month or so shy of being 10... *crosses fingers*. In other news, I finished "My Soul To Take", which I thought was awesome! I hope to post a review soon, but school is taking over my life. I have at least 300 pages of text book reading to do over the next week, so it may be a while before I get all caught up. I thought there was something else I wanted to write about... but I am seriously dead tired and I can't think of it. I think I'll read some scary stories before I go to bed and hope they don't give me nightmares. That's crazy that your cars done that many miles! I'd want it to stay at that number! Because it's a nice round number! I'm a little strange! I wish I could drive! Test this week, so fingers crossed :/!